Globish is back also on CataMag the only ad free (free, free, free ! ) catsailing news website. Just to say : Cocorico ? So sorry I can’t help . I’ve to be more serious for foreign readers. First at all because French catsailors have been some of the fastest catsailors in the world this year: Billy Besson with Jérémie Lagarrigue Champ’ of an incredible 160 crew and 22 nations, F18 world in italy (who cares about AC72 tips there, François Gabart and Matthieu Vandame do not need that indeed to be at the top). Arnaud Thieme HC14 world Champ., Orion Martin and Charlotte Hilliard HC16 Euro-Champions for the second time, Emeric Dary with Maxime Blondeau Wild Cat world-Champion, Trebaol brothers SL16 world-Champion for the second time, Franck Cammas with Louis Viat winning the little cup. Only ISAF youth, Dart 18 and A Class are not with frogs on international podium for 2013. Impressive isn’t it ? Billy Besson Champion again with Marie Riou in Nacra 17 world catsailors of the year (no poll there, it is France, a f… sovietic country). And I do not forget the N17 french squad: Vaireaux/Audinet (Euro vice-Champ. ), Morvan/Riou (podium at the Euro. ), Cammas/De Turkheim winning the SOF (French Olympic week). Such a long list to introduce 2 main subjects. The first is about the french technical catsailing art in 2013, the second part upon kind of « race-spirit »: do not split the fleet. Technical French team and Swiss/French (good mix !) Groupama an Hydros have done outstanding job and be on the top of the catsailing design technical art (yes, there is a difference) and racing by dominating the Little Cup. Do notice that Challenge France (Mr Muyl) are preparing for the next swiss opus.. That is obviously the most important technical fact of this year with some french name, key factor for the AC72 circus: Despierres, Kermarec, Prevost, Verdier…. short list with missing names (Nicolas help me, please). Cannot miss Philippe Presti, Oracle ‘s SUPER coach, as smart as nice guy and sailing A class in Sanguinet like a ordinary club member, (Sanguinet is the french A class Mecca). Another good design news Addiction is a brand new french A class, crossing fingers. French young Raphael Censier (look at our post from early 2011…) is also flying on his very nice garage made A Class ! Sailors are wise and want similar boat to challenge their nautical skill. Let’s have a look about F18 and A Class way, beyond official communication propaganda. There is only one Larry Ellison. So, not billionair catsailors and design technicians have to be wise and aware. If you want to keep your fleet alive, you’d better keep the boat as similar as possible. That is true for A Class which is an open and development class, there Misha Hermskeerk testimony is so interesting to read. 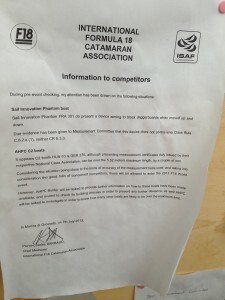 « The intention of these Class rules is to ensure that the boats are as alike as possible in all aspects affecting performance as F18 is a Measurement Controlled Class. The crew and the boat shall comply with the rules in Part II when racing. In case of conflict Section C shall prevail. Thanks to Jay Glaser (1984 Tornado Olympic silver medal and sailmaker) that ended by his excellent analysis (bottom of the page) a very bad try to spread thin sails (1,5 mm vs 3 mm) common sense understand that those sails are more light, so make boat faster but are not long last sails. Tornado OD sails using 3 mm sails are another sign of a safer trail . 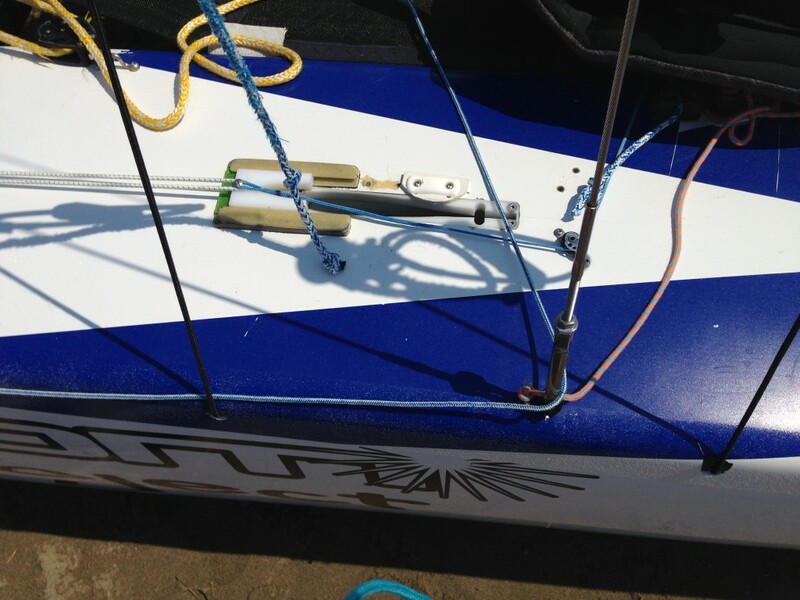 Because too long daggerboards, carbon pieces and other tips are now part of (too) expensive but still » low tech » F18. Less than 10 new boats for paying customers in France last year. It’s not only crisis and money. BMW business is ok in France . Truth is: (old ! ) catsailors are just looking for equity: as similar boat as possible to race. That is the fun. Faster are not so smart boat, because that is a dead end road (simply ask Tornado people). Just take a deep breath and think about that. … because similar boats means more boats. There I’m very happy to have worked with my friend James Baeckler for the french F18 association during 6 nice years. So proud that with Laurence, Thierry and Frédérique they were near 300 members of the french F18 association in 2012 when I left this good team to manage other duties (french MNA). French fleet is the world largest and with a lot of experience (sailing F18 since 1994 for me and still 3 F18 in my backyard). During this long time we see and make mistakes and learn what did work or not to increase the fleet. James is now leaving the F18 sec. gen office of the F18 world council after hard and good work. James is still french F18 association chairman elected, re-elected, and re-re-elected by the F18 french sailors since 2006 (anybody who have been kicked out of his own national association should be listening him carefully and respectfully) . Our pal of the council can keep on trusting him, James words are reliable. -just have a Catsailing day, with no design in your head, just sailing ! Un essai de trad dès que je peux.. Mais ce n’est point anglois, c’est pure globish ! . Le titre: Les sports d’hiver arrivent: fuyez ! Les « experts » du catamaran de sport sont de retour.